In the bustle of award season, the Screen Actors Guild Awards are easy to miss — but their glitz and glamour shouldn't be. In fact, there's something special about this particular show. 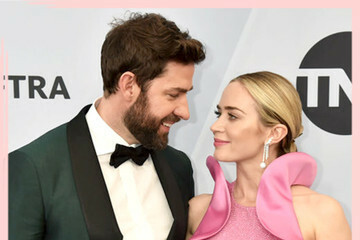 While it still has the formal red carpet walk with the panache of the Oscars, there's a playful spirit that can be seen in what the celebs wear. Nicole Kidman, for example, has worn sequined stripes and feathered "parrots" on her shoulders. As a nod to her movie, The Descendants, Shailene Woodley rocked Hawaiian flowers — exquisitely. Even Jennifer Lawrence tested new style territory in a hot pink Oscar de la Renta number. And these ladies are not alone, many of our favorite stars have dared to wear backless gowns, plunging necklines, loud prints, and vibrant hues. This is the place where A-listers aren't afraid to take risks and the result is anything but boring. Take a look at the past decade of dresses to see what we mean. Some you'll adore, others you won't, but they all made for unforgettable fashion moments.